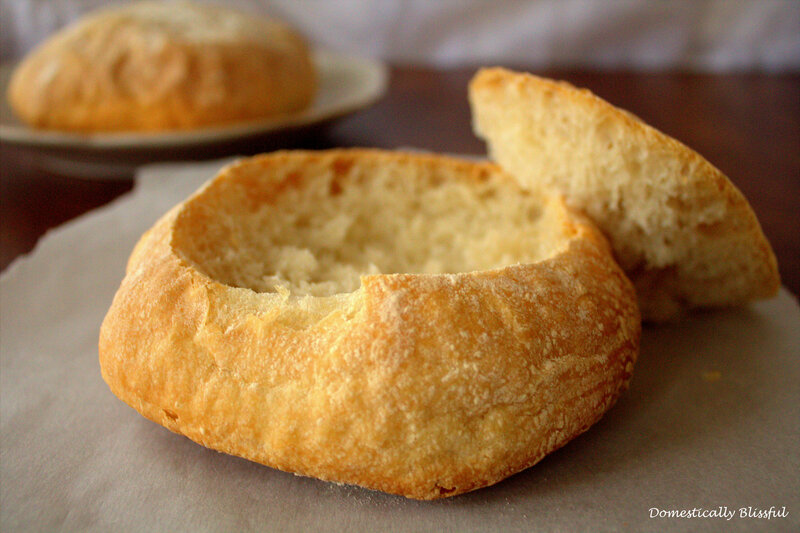 I love bread – especially this Homemade Ciabatta Bread! Someday Roger and I are going to travel the world and try every type of bread – and cheese – that we can possibly find! Isn’t that a wonderful life goal? This Homemade Ciabatta Bread is perfectly crispy and crunchy on the outside while being deliciously moist and airy on the inside! Seriously, just thinking about it makes my mouth water. Although Homemade Ciabatta Bread takes time to make – mostly time waiting – it is definitely worth the wait! After I made Ciabatta Bread the first time I had a hard time not making it every chance I got because it is just so good! 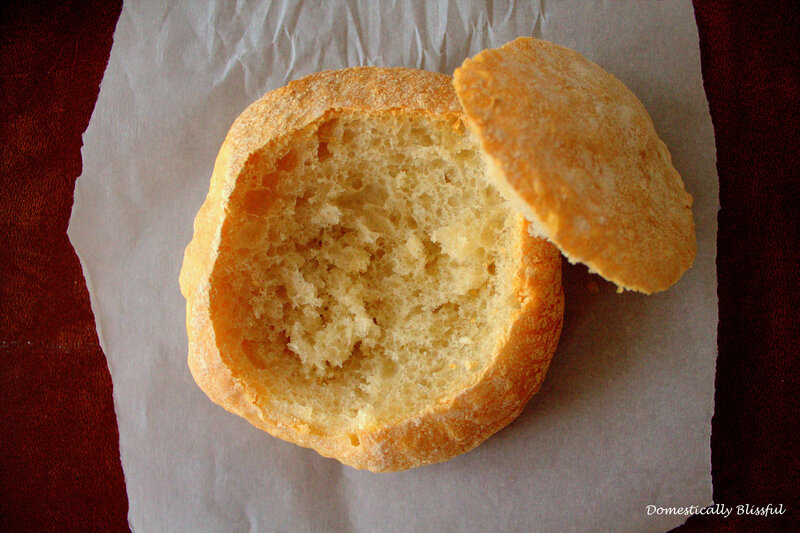 This Homemade Ciabatta Bread can be made into loaves, rolls, or bread bowls for soup. Luckily this recipe makes a lot of dough which means you can make a loaf, some rolls, and a few bread bowls! If you are looking for a good soup recipe for these Ciabatta bread bowls check out this vegetarian Broccoli Cheddar Soup recipe that taste just like the soup at Panera Bread! 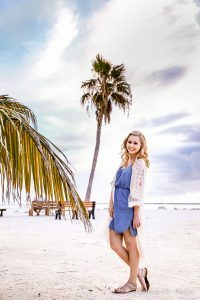 Biga Ingredients – I have seen this called Biga, Poolish, and Sponge and I read somewhere that the name depends on the variation of Ciabatta bread you are making. Since this is my own variation I’m not exactly sure what you would call it… Maybe Giusti’s Biga – Which won’t be too far from the truth if I eat most of this bread myself! 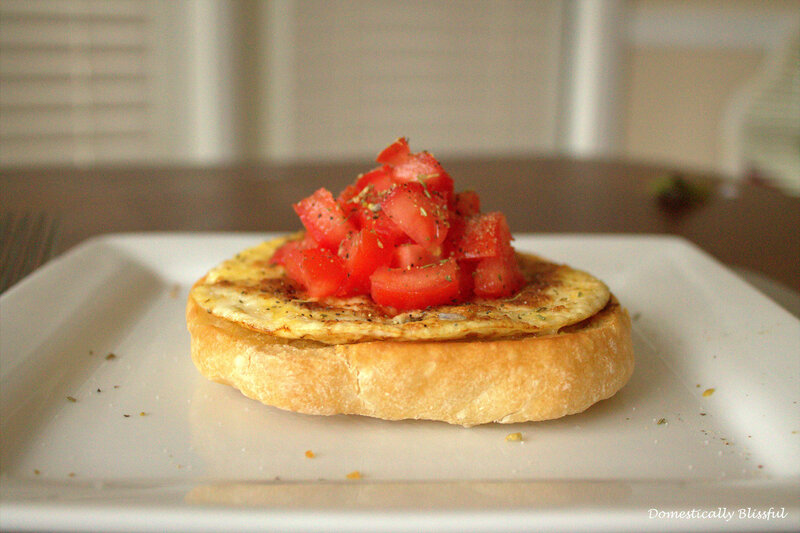 Pour ½ cup of warm to room temperature water in a bowl and gently whisk in the ¾ teaspoons of active-dry yeast. Then add the 1 cup of all-purpose flour and blend it in real good for about 2-3 minutes – it will look like a beautiful mess in the making. Let it rest, covered by plastic wrap, on the counter for about 8 to 12 hours – I usually do this at night and continue the process in the morning so this time it rested for over 12 hours and it still turned out great. 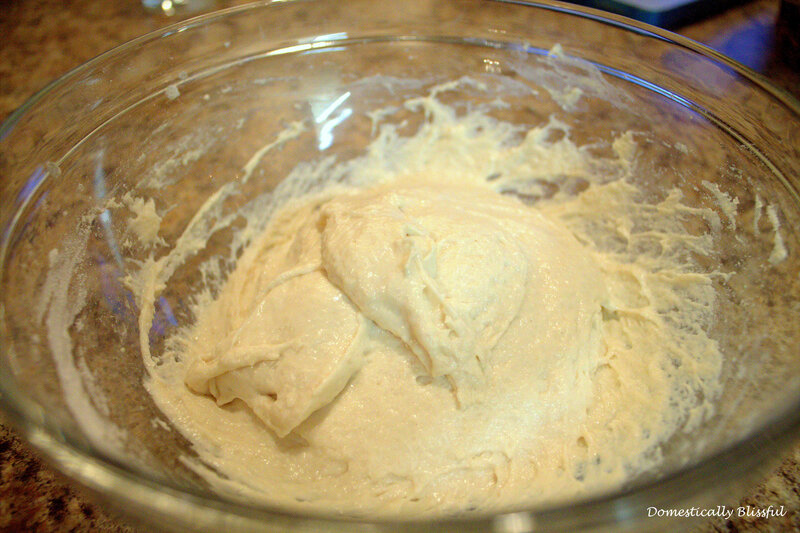 The next morning it will look like the above picture a wet and bubbly dough mess. 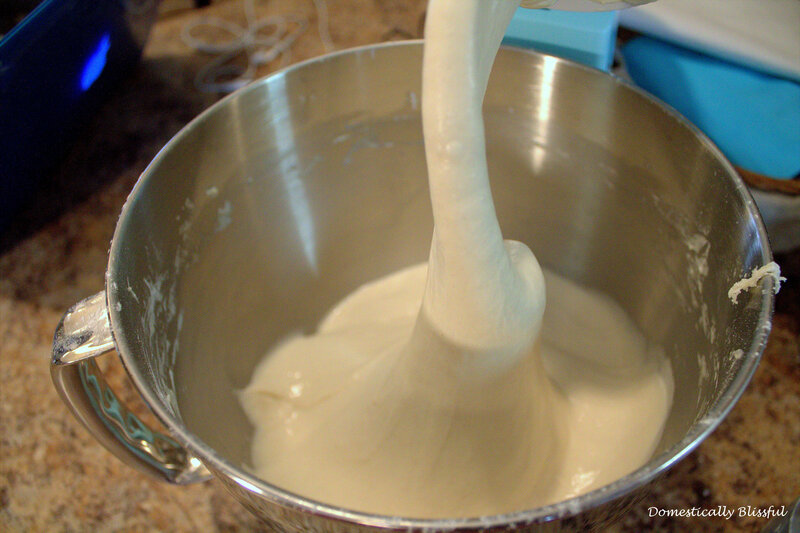 In the bowl of a stand mixer dissolve the 1 teaspoon of active-dry yeast into the 2 cups of water. 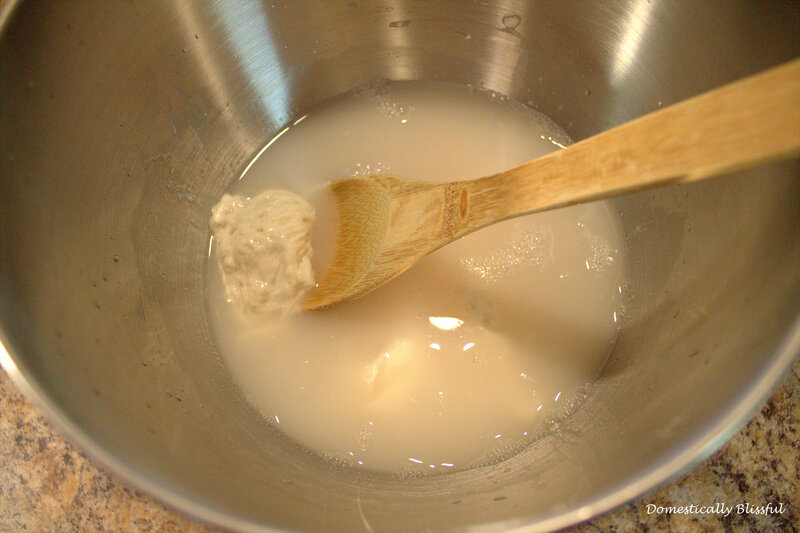 Then break up the biga into the dissolved yeast water using a wooden spoon or spatula so that it’s not just one big clump. Next, stir in the 4 and 1/2 cups of flour, 2 teaspoons of salt, and 1 ½ tablespoons of olive oil and let rest for 10-15 minutes. 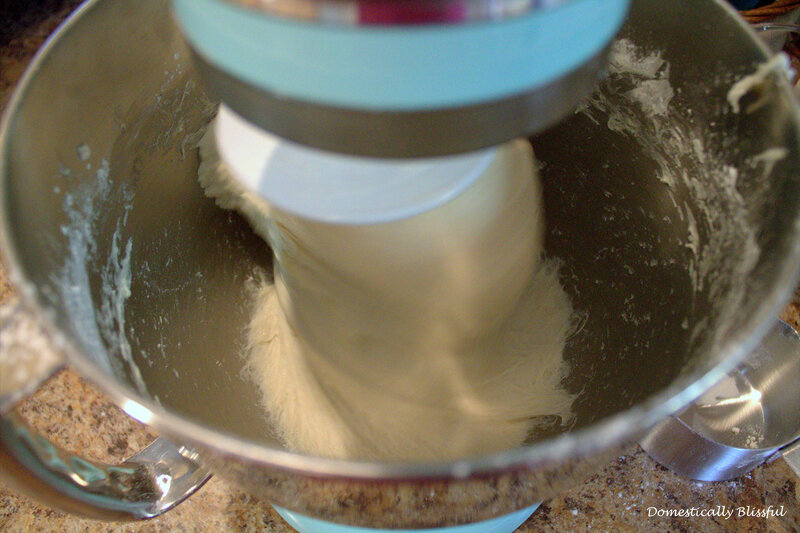 Using your dough hook kneed the dough for 15-20 minutes at medium speed – I usually use level 4 or 6 on my Kitchen Aid. Keep an eye on your dough and stand mixer during this time. 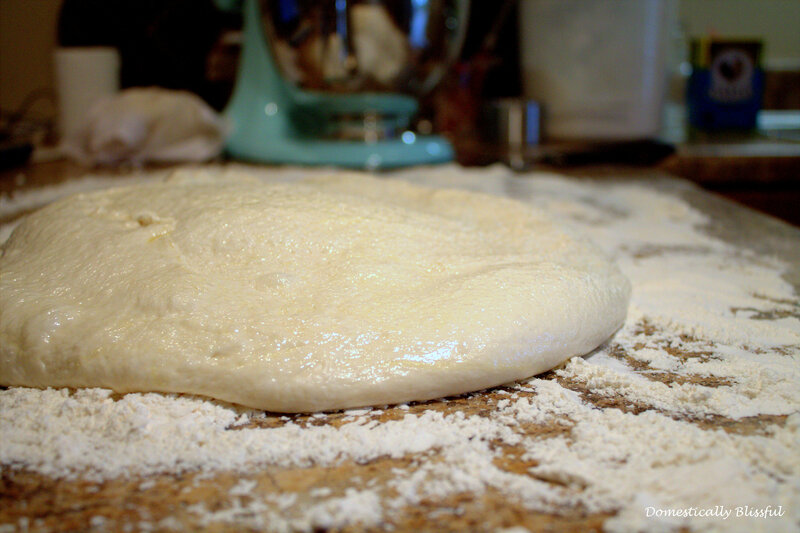 Between 5 and 10 minutes the dough should start coming together around the hook and slapping against the sides – this is a good sign even though it doesn’t sound like one. Sometimes when my dough is kneading it will start working its way up the dough hook, if this happens to you just stop the kneading, push the dough down, and start her up again! Also around this time your stand mixer might start to shake don’t worry it shouldn’t explode, this normally happens. 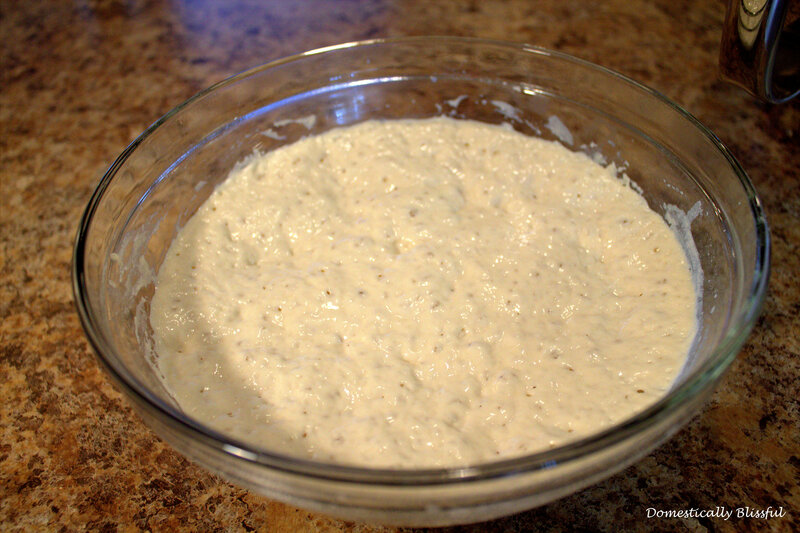 The dough is done kneading once it looks smooth – it will also have a nice glossy look. 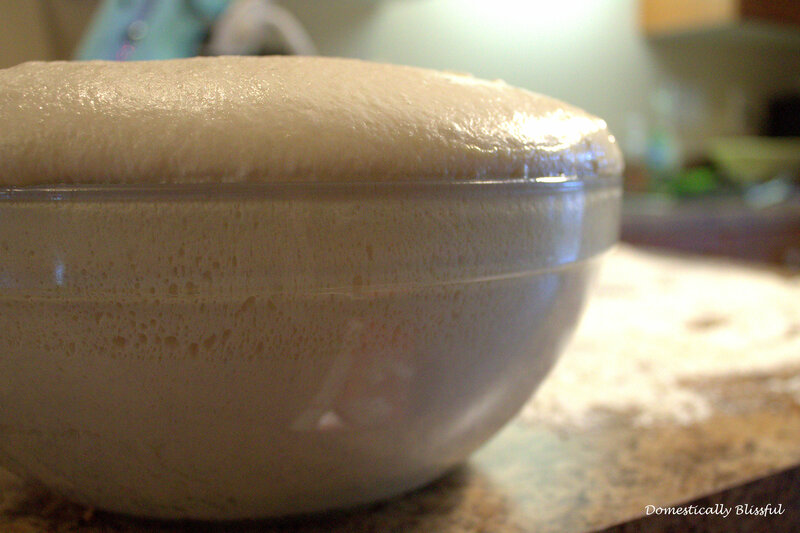 The dough should puddle back to the bottom of the bowl once you stop the mixer – this is also normal. 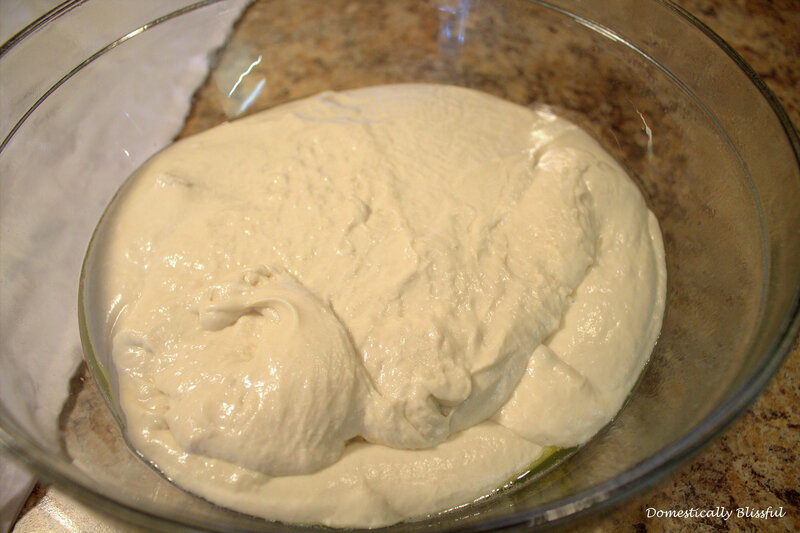 Place the dough into an oil sprayed bowl; cover it with a warm damp clean dishcloth sprayed with oil, and let the dough rise for 2-3 hours until it has tripled in size. Oh, and I also spray the top of the dough with oil too because my dough has a tendency to stick to everything! I usually do this by setting my oven to warm – 170 – then once it is warm, I turn the oven off and place the covered dough in the oven. On a clean counter covered heavily with flour carefully place the dough from the oven and onto your counter. 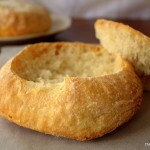 Shape the dough into 2-3 loaves, rolls, or into bread bowls using a pastry scraper or a good ol’ pizza cutter. 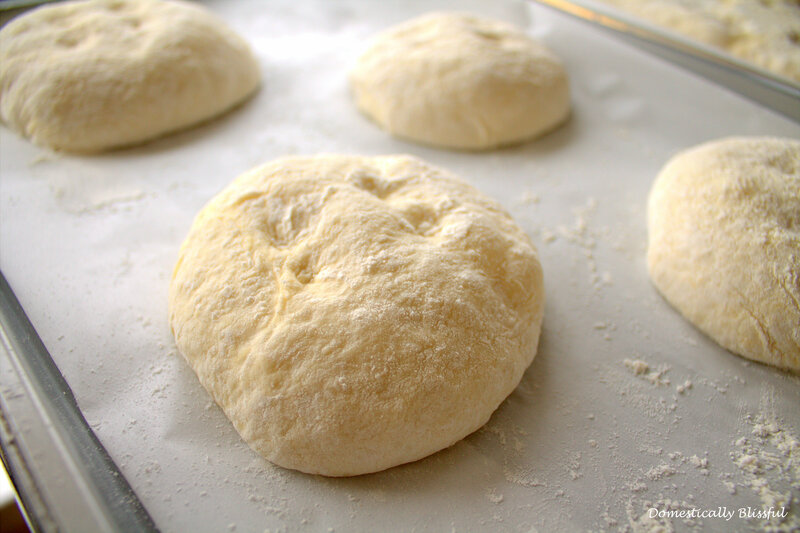 *Remember to be very careful during this process, you don’t want the dough to flatten – the dough will be a bit wet/sticky and should have lots of air bubbles. With floured hands place the shaped dough onto a parchment paper lined cookie sheet. 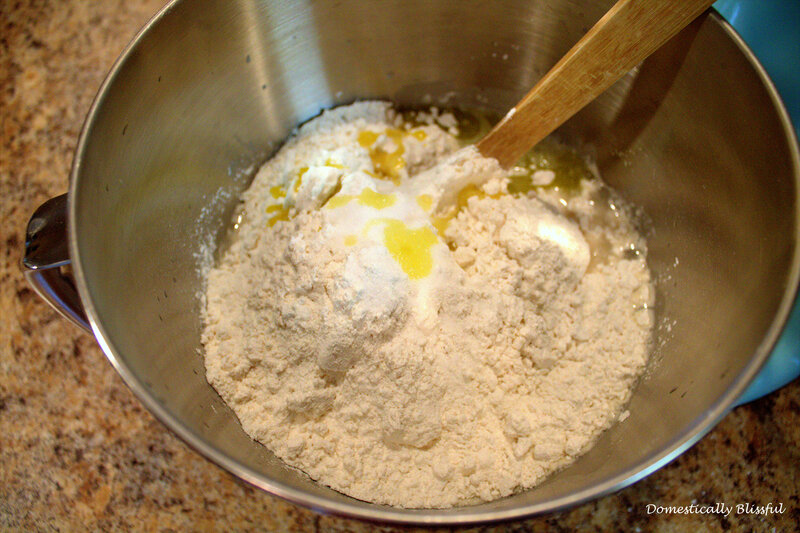 Then dimple the loaves by gently pressing your floured fingers into the dough – about halfway. Cover with a dampened towel – sometimes I even spray it with oil to prevent sticking – and let rise for 1 hour or until it has doubled in size. Preheat oven to 450° at the end up the rising period. 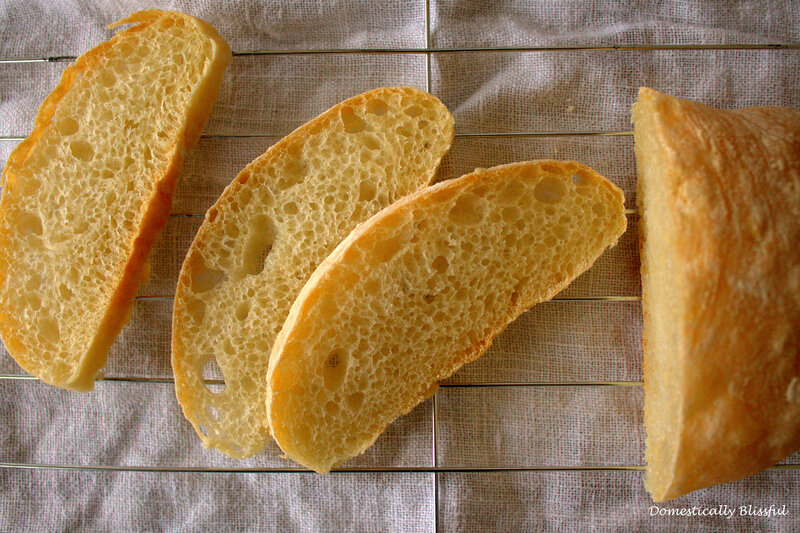 Bake the Ciabatta Bread for 20-30 minutes until golden brown. Remove from the pan and place on a cooling rack – if you weren’t able to get all of the bread in the oven the first go around go ahead and place the second batch in the oven. The next morning it will look like wet and bubbly dough mess. 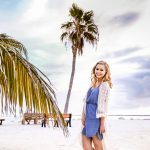 This sounds like weekend bread-I’m trying it next weekend! 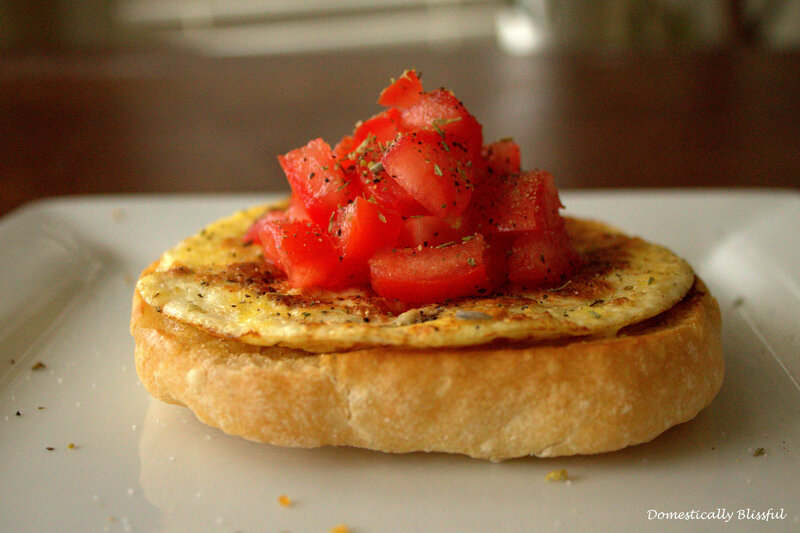 Thank you for sharing, this looks just delicious.